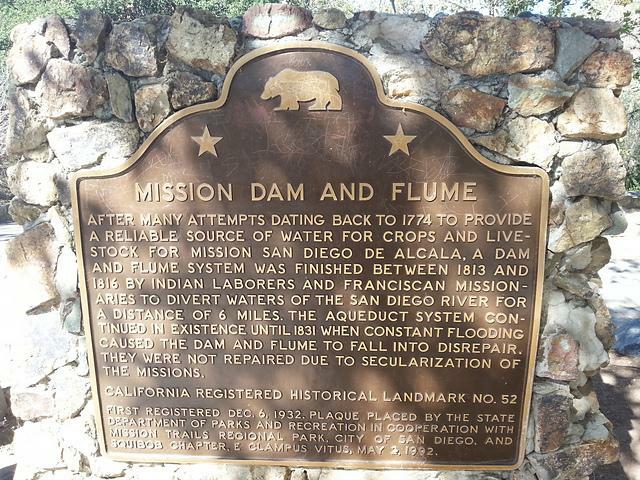 After many attempts dating back to 1774 to provide a reliable source of water for crops and livestock for Mission San Diego de Alcala, a dam and flume system was finished between 1813 and 1816 by Indian laborers and Franciscan Missionaries to divert waters of the San Diego River for a distance of 6 miles. The aqueduct system continued in existence until 1831 when constant flooding caused the dam and flume to fall into disrepair. They were not repaired due to secularization of the missions. First registered Dec. 6, 1932. Plaque placed by the State Department of Parks and Recreation in cooperation with Mission Trails Regional Park, City of San Diego, and Squibob Chapter. E Clampus Vitus, May 2, 1992. Easy walking, possibly wheelchair friendly, at least to the viewing area of the dam. This marker is part of the National Historic Landmarks series, and the E Clampus Vitus series. Located at the end of the parking area just off Father Junipero Serra Trail, which leads to the nearby dam. It was warm with high humidity the day I visited, so I didn't stay long. It's an interesting area with information plaques that explain about the construction, use, and benefits of the dam. This marker can also be identified by its HM code. You can use the hashtag #HMYGQ in tweets, and any other place where you might refer to this marker, including when searching on this site.